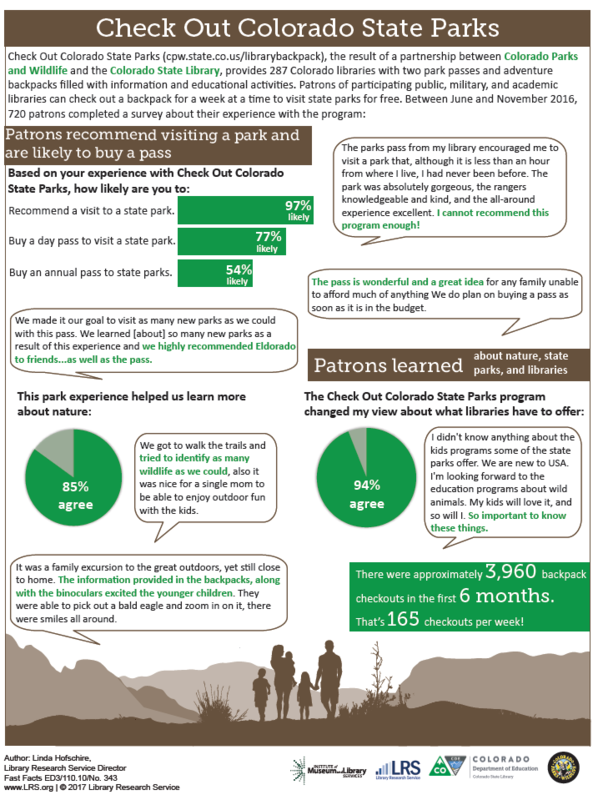 Check Out Colorado State Parks, the result of a partnership between Colorado Parks and Wildlife and the Colorado State Library, provides 297 Colorado libraries with two park passes and adventure backpacks filled with information and educational activities. Patrons of participating public, military, and academic libraries can check out a backpack for a week at a time to visit state parks for free. 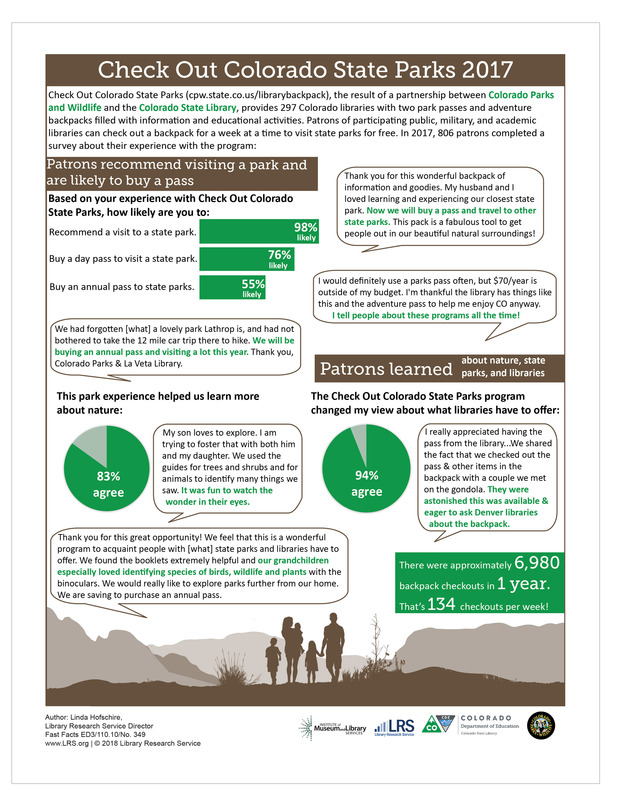 In 2017, 806 patrons completed a survey about their experience with the program. Click here for a printable version of this graphic. 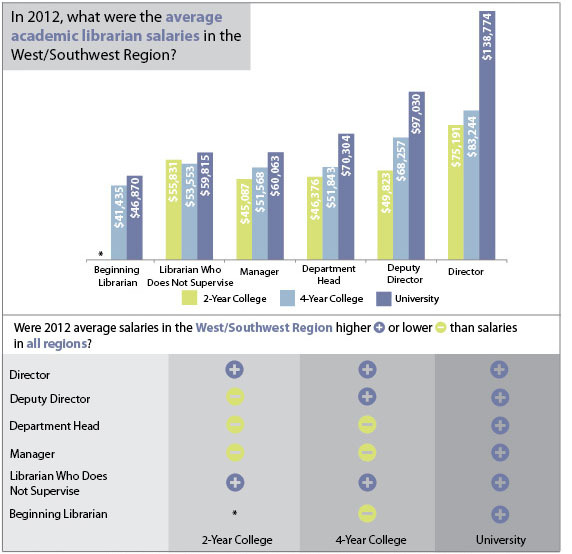 All data reported here are from the 2012 ALA-APA Salary Survey: Librarian—Public and Academic report from the American Library Association-Allied Professional Association. The West/Southwest region includes the following states: Alaska, Arizona, California, Colorado, Hawaii, Idaho, Montana, Nevada, New Mexico, Oklahoma, Oregon, Texas, Utah, Washington, and Wyoming. *Insufficient data for this category. 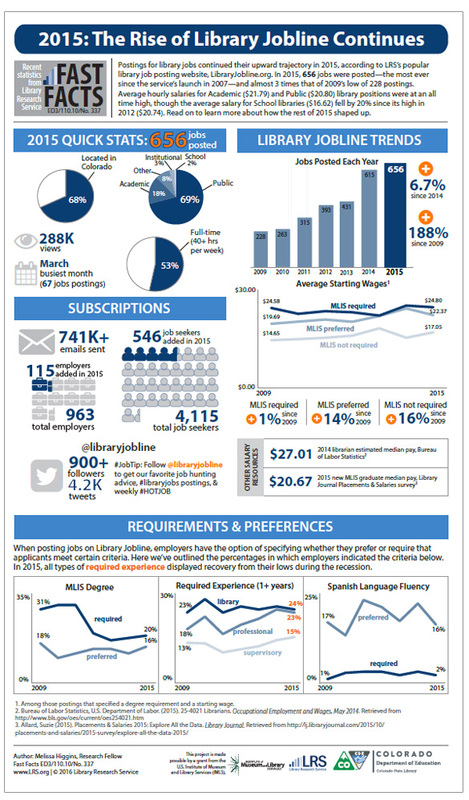 An examination of data from Library Jobline, a job-posting website operated by the Library Research Service, provides insight into Colorado’s library job climate. The data from 2012 shows that, for the third year in a row, the number of employment opportunities in the field has increased, but the level of compensation for professional-level library positions1 has decreased slightly since 2011. 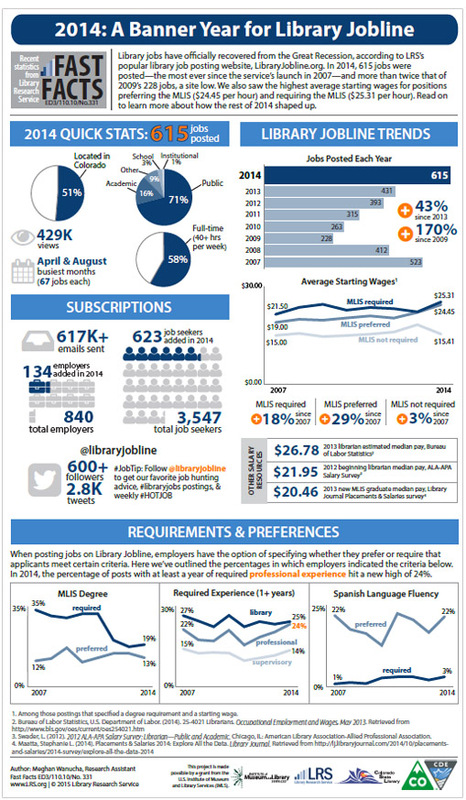 In 2012, 393 library positions were posted to Library Jobline, thus continuing the upward trend since 2009, when the number was just 228 (Chart 1).2 On average, 33 library positions were posted to Library Jobline each month during 2012. Compared with other months, June saw the most postings (49), whereas April saw the fewest (25). Library Jobline’s website redesign in early 2012 may have contributed to the influx in its subscriptions. An additional 97 employers registered with Library Jobline in 2012—an increase of 19 percent over the previous year—which brought the total number of registered employers to 602. The number of registered job seekers rose by 44 percent, or 729 members, which propelled Library Jobline’s total number of registered job seekers to almost 2,400. 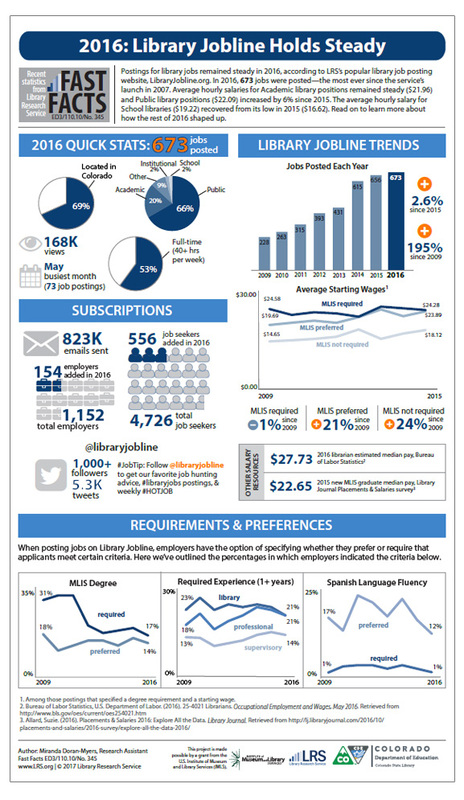 Despite sizeable increases in the number of job postings and the number of registered job seekers, LibraryJobline.org experienced less traffic in 2012 than in the previous two years. In 2012, Library Jobline postings were viewed 521,655 times—down more than 100,000 views from 2011, and more than 200,000 views from 2010. 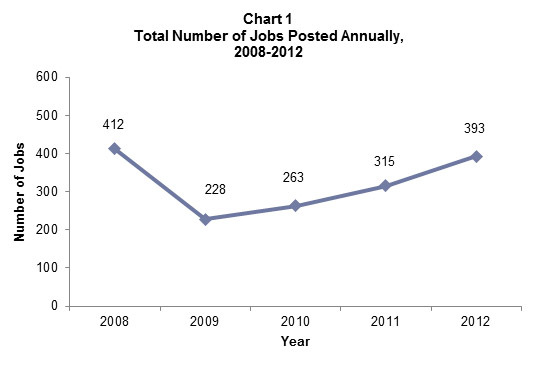 Curiously, more than one-third (37%) of the 2012 views were of jobs that were posted prior to 2012. 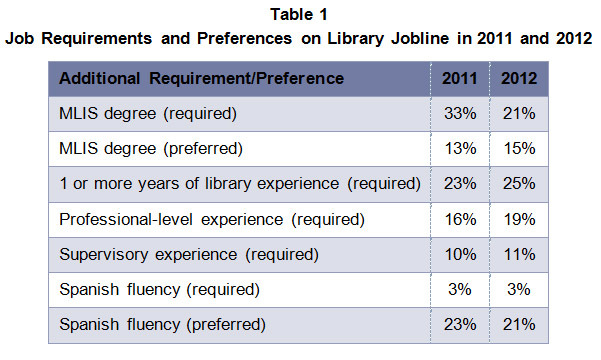 About one-fifth (21%) of the Library Jobline postings for 2012 specified that a Master of Library and Information Science (MLIS) degree was required—a decrease from 2011, when one-third (33%) required one (Table 1). An additional 15 percent of job postings in 2012 specified a preference for candidates with an MLIS degree, compared with 13 percent in 2011. The remaining 64 percent either specified that an MLIS degree was not required, or simply included no information about it. The percentage of job postings that listed additional requirements and/or preferences changed little from 2011. Compared to 2011, the average starting hourly wage decreased by $0.34 per hour for Library Jobline postings that specified the requirement of an MLIS/MLS degree, and $0.67 per hour for those that listed it as a preference (Chart 2). 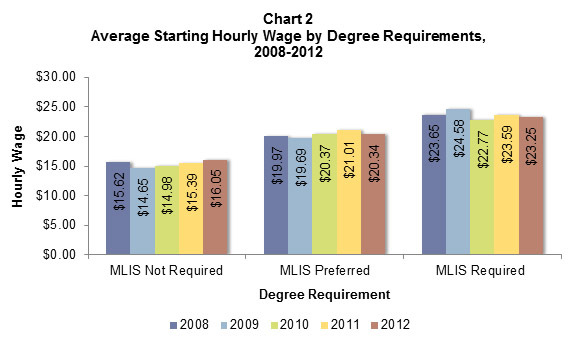 Conversely, the average starting hourly wage for postings that did not require an MLIS/MLS degree increased by $0.66 per hour. Although this may be unsettling for those who choose to pursue MLIS/MLS degrees, it is too soon to determine whether the decline in compensation for professional-level library jobs since 2011 is a trend. 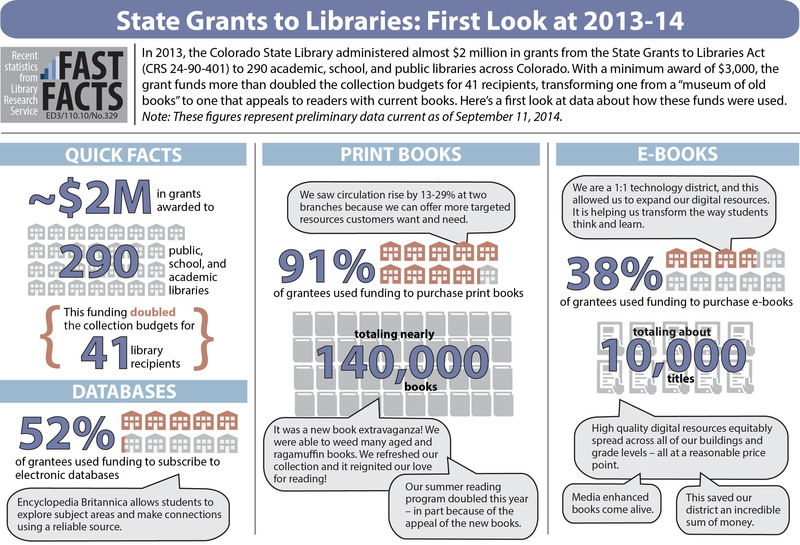 Library Jobline’s 2012 data offers mixed messages about Colorado’s library job climate. 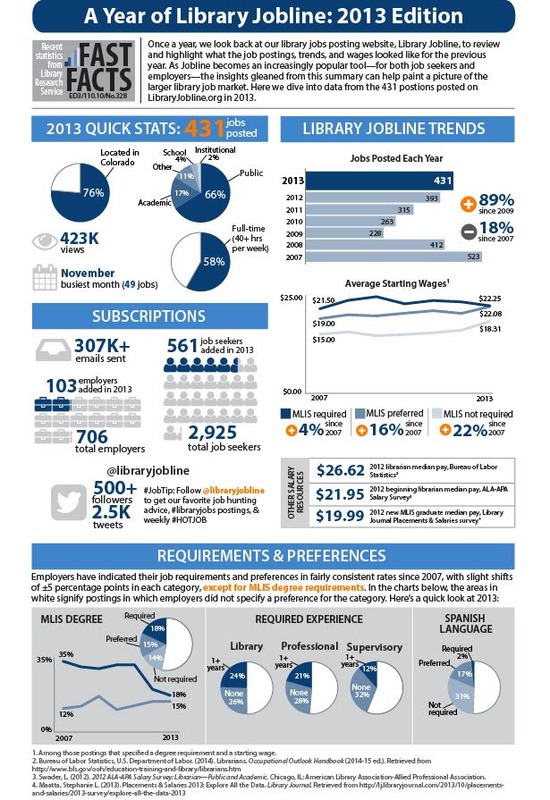 The number of employment opportunities listed with Library Jobline has steadily increased since 2009, and offers hope that it might soon reach pre-recession levels. Unfortunately, average starting hourly wages for library positions posted with Library Jobline do not demonstrate the same upward trend. Indeed, 5 years of data suggest that starting wages are stagnant overall. Job seekers can likely expect more opportunities for Colorado library employment in the coming years; however, they should not count on higher levels of compensation.